The US has struck the Syrian airbase used to launch a suspected sarin gas attack against Khan Sheikhun that killed more than 80 civilians. US President Donald Trump and Secretary of State Rex Tillerson cited the chemical attack as the reason for their country’s first direct involvement in Syria’s six-year war. A Pentagon spokesman said Russia was informed ahead of the attack on the al-Shayrat airbase. According to the Associated Press, opposition group the Syrian Coalition, has welcomed the intervention. The rebel commander whose district was hit by the suspected chemical weapon attack has said he hopes the strike will be a “turning point” in the war. By the end of 2016, for instance, opposition forces in the Syrian city of Aleppo had been overwhelmingly defeated, raising doubts about their ability to endure the fight against the Assad regime. Especially as the latter receives active support from the Russian government and Shi’a militias. Scholars and researchers were largely divided after the Aleppo assault. Some viewed the outcome as the beginning of the end for the losing party – the Stalingrad moment of the Syrian war. Others recognised the importance of the events without considering them decisive. After their defeat in Aleppo, many opposition groups reconsidered their inter-factional alliances. In the Idlib governorate and the countryside around Aleppo, for instance, a number of factions merged with what used to be known as the Nusra Front, or Jabhat Fath el-Sham, to form the new Hay’at Tahrir al-Sham. Tensions heightened between these two prominent opposition groups as a number of Ahrar al-Sham combatants defected to the recently formed Hay’at Tahrir al-Sham. The outcome so far has been a delicate balance of power between these two large groups, which represent the most powerful opposition forces in Idlib and its vicinity. Together they govern the last opposition stronghold, and Assad’s ultimate victory in Syria depends on the divisions and tensions between them. If these groups are not able to unite when and if pro-Assad forces rally again, Idlib, which is the only area under comprehensive rebel control, might go the way of Aleppo. Its fall would leave the opposition controlling only small isolated patches of territory. Given that Ahrar al-Sham and Hay’at Tahrir al-Sham have maintained their cooperation thus far, Idlib promises to be a much bigger challenge for the Assad regime than landlocked Aleppo. A siege on Idlib is practically impossible as long as its border with Turkey stays under opposition control. To disrupt the regime’s momentum and prevent it from regrouping its forces, this time around Idlib, both Hay’at Tahrir al-Sham and Ahrar al-Sham have launched an offensive on the Hama front. 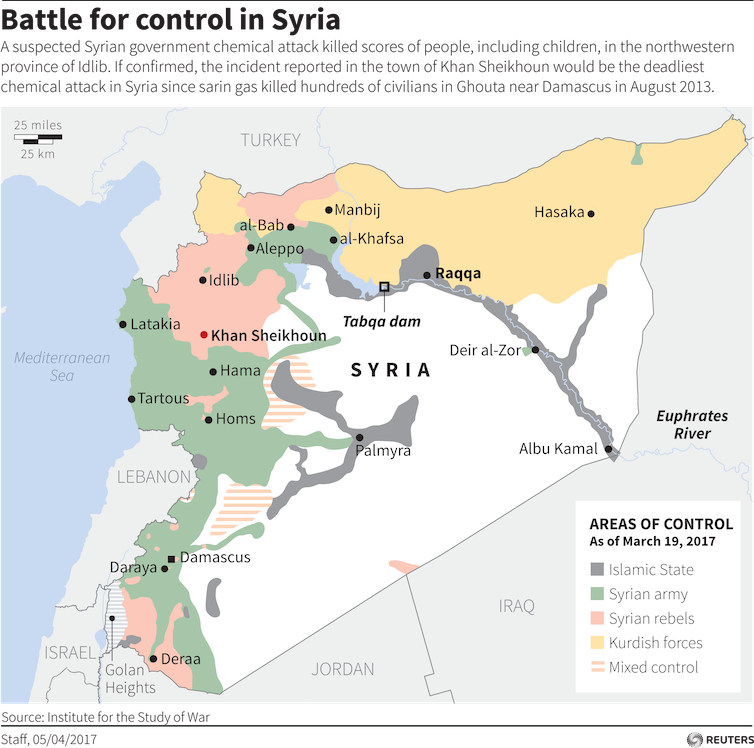 Since March 21 2017, opposition forces have taken dozens of government-held villages, coming within a few kilometres of the city of Hama. In light of these conditions, opposition forces near southern Aleppo may also attempt an offensive on the town of Khanasir, cutting off the government’s supply route to its forces in Aleppo and forcing pro-regime troops to disperse in different directions. The Hama offensive opens new possibilities for the opposition. But to succeed on this front government forces must be kept occupied elsewhere. So, while opposition forces were mobilising in Hama, other rebel factions such as Faylaq al-Sham reopened the Damascus front in the areas of Qabun and Jobar, less than six kilometres from the heart of Syria’s capital. Opposition forces have not made any significant gains yet. But the proximity of these new clashes to Damascus is sufficient to keep the regime’s forces in the area occupied and committed. Another condition favouring opposition forces is the current vacuum in Syria’s sparsely populated Badiya desert region, resulting from the ongoing battle for Raqqa. The key to Assad’s future may well lie with the Russian reaction to the US move. As the country woke to the news of the overnight attack, the head of the defence and security committee of the Russian upper house of parliament said his country would call for an urgent meeting of the UN Security Council. Next articleSyrian airbase struck by US missiles: What’s the damage?